We are super thrilled to be holding a Something Special Twitter Party next week, on Thursday 12th September from 4pm to 6pm. . You can join at home too, during the party there will be online spot competitions and more fun and games to take part in, so make sure you are ready to go as the party starts at 4pm. 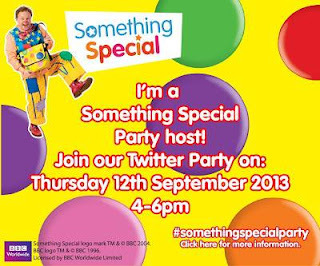 So everyone can join the fun at the Something Special Twitter Party! I will, be tweeting throughout the week. Check all the awesome goodies we received this week for our Something Special Twitter Party, there was so much we can't wait for next week. Goody Bags & pass the parcel. How: Follow @ukmumstv on Twitter and make sure you use the hashtag #SomethingSpecialParty to follow the party!